Notice! Alan Xafira Deluxe Resort & Spa does not accept reservations at this time. Please try again later. Alan Xafira Deluxe Resort & Spa Contact. Located in Avsallar area, Xafira Deluxe Resort&Spa has a private beach only 500 metres away. Featuring a palace-like architecture, the resort offers an outdoor pool, indoor pool, fitness centre, tennis court and spa facilities. Free Wi-Fi is available in public areas. Modernly furnished, the rooms of Xafira Deluxe Resort&Spa include a flat-screen TV, air conditioning and a minibar. Some units have a private pool. 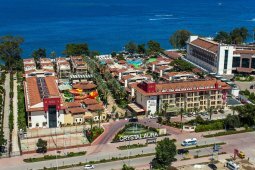 Featuring both indoor and outdoor dining area, the main restaurant serves selected dishes from Turkish and international cuisine for breakfast, lunch and dinner in open buffet style. The à la carte restaurants offer Turkish, Far East and Italian cuisine. You can also enjoy a variety of drinks from the bars. The resort offers free shuttle service to beach in every 15 minutes from 08:00 until 20:00. 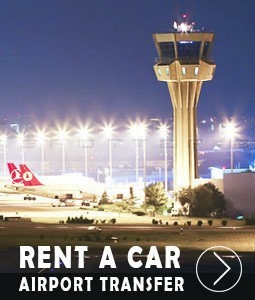 It is 60 km from Gazipasa Airport and 100 km from Antalya Airport. Alan Xafira Deluxe Resort & Spa accepts VISA and reserves the right to temporarily hold an amount prior to arrival. Alan Xafira Deluxe Resort & Spa accepts Master Card and reserves the right to temporarily hold an amount prior to arrival. Alan Xafira Deluxe Resort & Spa accepts Maestro and reserves the right to temporarily hold an amount prior to arrival. Alan Xafira Deluxe Resort & Spa accepts Bank card and reserves the right to temporarily hold an amount prior to arrival. Alan Xafira Deluxe Resort & Spa accepts ATM card and reserves the right to temporarily hold an amount prior to arrival. The main restaurant serves as an open buffet during breakfast, lunch and dinner hours. Our main restaurant offers delicious examples from national and international cuisines. There is a closed area for children and an open-air terrace. Snack Restaurant Snack-style lunch, salad and fruit bar during the day, rich snack varieties and open-air lunches invite you from 12: 00-15: 00. Bistro Restaurant Bistro Our restaurant serves our guests 24 hours a day with a rich menu. Patisserie From 16.00 to 24.00 you can enjoy our pastry tastes appealing to your taste buds. Far East Restaurant The traditional and most exclusive varieties of Far East cuisine are presented. You should try this traditional cuisine of the Far East. Turkish Restaurant We will give you a festive atmosphere with the historical atmosphere of our restaurant where we offer you the most distinguished examples of food culture and rich Turkish and Ottoman cuisine. During the special days of the week, unique tastes of Black Sea, Aegean, Mediterranean and other areas await you. Italian Restaurant Italian cuisine is waiting for you. You can enjoy the view of the pool by sipping your inclusive beverages. Beach Bar You can dive into the blue while sipping your drinks on the beach accompanied by Mediterranean sea views. It is at your service from 10:00 to 18:00. Amphi Bar While enjoying our entertaining animation shows, we can enjoy concept drinks from 10:00 to 21:30. Disco Bar is at your service between 23:00 - 02:30 with the latest music and rich bar menu in the unique environment of Mediterranean. - All A la Carte restaurants are conditioned to make reservations 24 hours in advance. Minibar drinks are supplemented with water and soda on the following days after the entrance day. There are two bedrooms in the family rooms with pool and land view; there is only a partition in between. Tesiste does not serve alcoholic beverages for children under the age of 18. Guests under the age of 16 are not allowed in the fitness center, hammam, sauna and steam room. Access to the Xafira Deluxe Resort & Spa rooms starts at 14:00. The departure time from the rooms is no later than 12.00. Pets are not allowed. The use of outdoor open spaces is subject to seasonal conditions. DO NOT STAY HERE!!!! Staff are VERY rude. Staff just happily walk into your room while youre sleeping. Happened several times Food was disgusting with no variety, served the same stuff every night. My girlfriends engagement ring which WAS IN its box (planning to propose) was stolen from our hotel room and nobody helped figuring out where it went. I'm glad to be home and I WILL NOT be staying there again. The price is really cheap. But service is usually bad. Beach is worst ever. Food and alcohol are low quality. But maybe for this price is OK. The hotel is ok for the price but could be better service, cleaning and so on. Some places like a spa are really dirty. Terrible beach. The food is ok but alcohol is very bad!